The Obama Administration should make sure Congress is on board with its efforts to bolster ties with Vietnam. Since normalizing diplomatic relations with Vietnam in 1995, the United States has become Vietnam’s top trading partner and one of its leading foreign investors. Vietnam’s economic growth has been rapid in the past twenty years. In 2018, the country hopes to be recognized as a market economy and, by 2020, it hopes to reach industrialized status. Political reform and human rights protection, however, have not kept pace with economic growth. These issues have emerged as areas of concern for some U.S. officials, who seek a more proactive foreign policy in Vietnam to curtail human rights abuses and promote the rule of law. Their concerns run up against the Obama Administration’s desire to expand the United States’ military and economic engagement with Vietnam and turn it into a strategic ally in Southeast Asia. Since the Obama Administration’s rebalance towards Asia, the U.S. has increased its military cooperation with Southeast Asian countries, such as Vietnam and the Philippines, to counter-balance China’s growing influence in the region. Vietnam’s ports, its membership in ASEAN, as well as its growing market for American goods could make it an important regional partner. The Administration’s courting of Vietnam takes place at a unique time in the region’s history. Vietnam’s historic relationship with China has waned recently due to China’s growing assertiveness over maritime territory in the South China Sea. As a result, Vietnam has reached out to a number of countries to guard itself against potential Chinese antagonism. The Obama Administration has greatly increased the U.S. resources it allocates to Vietnam. In its 2014 Fiscal Budget, the Department of State increased its funding levels for international military education and training assistance as well as foreign military financing assistance. While Secretary of State, Hillary Clinton traveled to Hanoi multiple times. Former Defense Secretary Leon Panetta visited the country as well. In June, General Martin Dempsey met with his Vietnamese counterpart Bo Da Ty at the Pentagon. Moreover, the United States and Vietnam have been busy negotiating the Trans-Pacific Partnership Agreement, a free-trade agreement that would benefit Vietnam’s growing economy. The recent visit by Vietnamese President Truong Tan Sang highlighted the Administration’s attempts to engage with Vietnam. At the end of Sang’s visit, he issued a joint statement with Obama detailing the establishment of a U.S.-Vietnam Comprehensive Partnership to provide a framework for advancing the relationship. U.S. Ambassador to Vietnam David Shear called the visit a success and said that further meetings will be held throughout the year. Political reform and human rights, however, have the potential to hinder, if not derail, the Administration’s hopes for partnership with Vietnam. For many government officials, these issues are a deal-breaker. Prior to Sang’s visit, the House Committee on Foreign Affairs Subcommittee on Asia and the Pacific held a hearing on the United States relationship with Vietnam, during which Vietnam’s human rights abuses emerged as a focal point. Members of the subcommittee expressed their concern over government abuses against human rights advocates and religious leaders and called upon the U.S. to put pressure on Vietnam to respect human rights and the rule of law. Legislation currently making its way through Congress could hamper United States engagement with Vietnam. During a mark-up session on June 27, House Foreign Affairs Committee passed H.R. 1897, a bi-partisan bill to promote freedom and democracy in Vietnam. The committee noted that Vietnam’s backtracking on human rights protection, democracy, and freedom of the press could put a ceiling on United States engagement with Vietnam, despite the country’s geo-strategic importance. The legislation blocks non-humanitarian assistance to Vietnam if the government does not improve its conduct towards political and religious prisoners. During the mark-up session, Chairman Ed Royce called the bill a “message with teeth” to the Vietnamese government. The Obama Administration is aware of these potential obstacles. It also has concerns over human rights abuses in Vietnam. In 2010, Hillary Clinton, while Secretary of State, warned Vietnam that it must improve its human rights record. 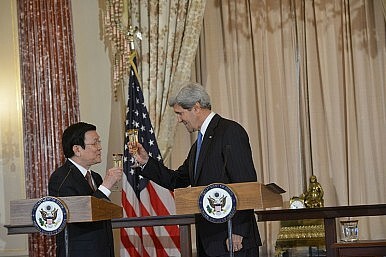 Joseph Yun, then Acting Assistant-Secretary in the Bureau of East Asian and Pacific Affairs, currently the nominee to be United States Ambassador to Malaysia, told Congress that the Administration informed Vietnam that upgrading the United States-Vietnam relationship would be difficult without improving its respect for human rights. Despite their shared concerns, the Obama Administration and Congress seem to have two different acceptability thresholds for developing the United State-Vietnam relationship. The Obama Administration, more preoccupied with national security and regional military alliances, seems to place the human rights and political situation in Vietnam at a lower level of importance than do members of Congress, who face much more pressure from constituents, especially Vietnamese-Americans. Before the Administration continues the U.S.-Vietnam partnership or makes commitments to Vietnam, the president should first engage with Congress to ensure that his foreign policy will not face domestic opposition. Ryan McClure is an attorney and foreign policy blogger. He can be followed on Twitter @The BambooC. Repression Rising in VietnamWill the Environment Be the Vietnam Government’s Downfall?Vietnam's Growing Protest CultureObama's Warm Welcome in VietnamVietnam’s New Environmental Politics: A Fish out of Water?